The Commute (or lack thereof) – You can get from one end of town to the other in 15 minutes. Most commutes are less than 10 minutes. There are rarely any traffic jams. This means you can spend more time with your family, coaching baseball, or serving your community in various ways. It’s Very Affordable – The average home value is $130,000 and the average rent is $800. These huge cost savings mean you can spend less time working and more time doing those things that bring fulfillment and purpose. 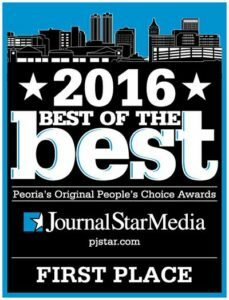 City of Innovators – Wall Street 24/7 named Peoria the #22 most innovative city in the country. Peorians were issued 3,321 patents between 2000 and 2015. In 2014, Greater Peoria invested over $2 billion in research and development and in 2012 we exported more merchandise per capita than any other place in the country. We Build Things – Greater Peoria has an extensive history in heavy metal manufacturing – 24,000 people in our regional workforce are employed in the manufacturing industry — which is 54% higher than the national average. This concentration has benefited the region in many ways including the availability of higher income jobs, extensive logistics systems, and well-developed international infrastructure. Natural Beauty – Peoria’s river valley and bluffs are replete with giant oak and vibrant redbud trees. The rolling landscape changes allow for expansive vistas. Most famously, Grandview Drive is a destination for photo ops and tourists around the country. Sightseers also flock to the river which is home to the bald eagle. Travel – If you like to travel, it makes sense to make Peoria your home base. Our new airport is a breeze to get in and out of. It has free parking and flies nonstop to all major domestic airport hubs and many popular warm weather tourist destinations. If trains are your thing, a short 30 minute drive to Galesburg or Normal puts you on two major national train routes.